Vegas night was great. The teachers from Island Academy did a wonderful decorating and staffing the event. Between the Bingo, Blackjack, Poker, The Small World Band and the all you can eat pizza there was something for everyone! tacogirl did a great job decorating inside as well. Check out more of her photos at tacogirl.com. 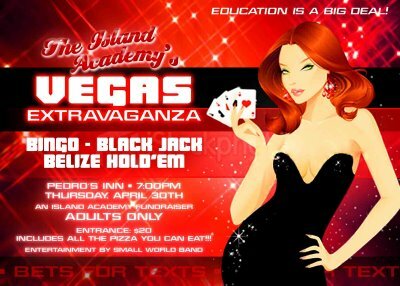 Come Join us on Thursday April 30th, 2008 at Pedro’s Sports Bar for the 1st ever Island Academy Vegas Extravaganza – because Education is a Big Deal! Entrance Fee is $20, which includes all the Pizza you can eat! Also featuring the cool island stylings of the Small World Band. This is a Fundraiser to raise money for new textbooks for next school year at Island Academy. Tell all your friends and stop by for this worthy cause.